THE HOCKEY SCHTICK: WSJ: The Myth of the Climate Change '97%'; What is the origin of the false belief that almost all scientists agree about global warming? Where did Mr. Kerry get the 97% figure? Perhaps from his boss, President Obama, who tweeted on May 16 that "Ninety-seven percent of scientists agree: #climate change is real, man-made and dangerous." Or maybe from NASA, which posted (in more measured language) on its website, "Ninety-seven percent of climate scientists agree that climate-warming trends over the past century are very likely due to human activities." Ms. Oreskes's definition of consensus covered "man-made" but left out "dangerous"—and scores of articles by prominent scientists such as Richard Lindzen, John Christy, Sherwood Idso and Patrick Michaels, who question the consensus, were excluded. The methodology is also flawed. A study published earlier this year in Nature noted that abstracts of academic papers often contain claims that aren't substantiated in the papers. Another widely cited source for the consensus view is a 2009 article in "Eos, Transactions American Geophysical Union" by Maggie Kendall Zimmerman, a student at the University of Illinois, and her master's thesis adviser Peter Doran. It reported the results of a two-question online survey of selected scientists. Mr. Doran and Ms. Zimmerman claimed "97 percent of climate scientists agree" that global temperatures have risen and that humans are a significant contributing factor. The survey's questions don't reveal much of interest. Most scientists who are skeptical of catastrophic global warming nevertheless would answer "yes" to both questions. The survey was silent on whether the human impact is large enough to constitute a problem. Nor did it include solar scientists, space scientists, cosmologists, physicists, meteorologists or astronomers, who are the scientists most likely to be aware of natural causes of climate change. In 2010, William R. Love Anderegg, then a student at Stanford University, used Google Scholar to identify the views of the most prolific writers on climate change. His findings were published in Proceedings of the National Academies of Sciences. Mr. Love Anderegg found that 97% to 98% of the 200 most prolific writers on climate change believe "anthropogenic greenhouse gases have been responsible for 'most' of the 'unequivocal' warming." There was no mention of how dangerous this climate change might be; and, of course, 200 researchers out of the thousands who have contributed to the climate science debate is not evidence of consensus. Mr. Cook's work was quickly debunked. In Science and Education in August 2013, for example, David R. Legates (a professor of geography at the University of Delaware and former director of its Center for Climatic Research) and three coauthors reviewed the same papers as did Mr. Cook and found "only 41 papers—0.3 percent of all 11,944 abstracts or 1.0 percent of the 4,014 expressing an opinion, and not 97.1 percent—had been found to endorse" the claim that human activity is causing most of the current warming. Elsewhere, climate scientists including Craig Idso, Nicola Scafetta, Nir J. Shaviv and Nils- Axel Morner, whose research questions the alleged consensus, protested that Mr. Cook ignored or misrepresented their work. Mr. Bast is president of the Heartland Institute. Dr. Spencer is a principal research scientist for the University of Alabama in Huntsville and the U.S. Science Team Leader for the Advanced Microwave Scanning Radiometer on NASA's Aqua satellite. Victor, you are a man of few words. Still waters run deep? i get so tired of people basically lying and repeating this completely ridiculous assertion. Added to the bad numbers one could see that the academy is not a safe place politically for skeptics to speak up and one is forced to wonder how many skeptics there are who refuse to speak up for fear of reprisal. INTERESTINGLY, NASA have taken their Web pages off line that mention their support of the 97% figure - a coincidence? "Ninety-seven percent of climate scientists agree that climate-warming trends over the past century are very likely due to human activities." OK then, if 97% is a problematic number, what IS the percentage? 92%? 99%? Maybe a survey of actual climatologists would be in order to help us know. What defines a climatologist? Climatologist is an ambiguous term. While Dr. Mann might call himself a climatologist his official title at the Penn State is "Distinguished Professor of Meteorology". As you have seen in the above surveys the warmmongers want to limit sampling to only those who publish primarily on climate change. That is like limiting a survey to determine the veracity of homeopathy to only those who publish primarily on homeopathy. Maybe less than 40%. From the article - "Only 39.5% of 1,854 American Meteorological Society members who responded to a survey in 2012 said man-made global warming is dangerous." 100% of scientists agree on gravity, inertia, the freezing and boiling point of water and so on... since when does anything unprovable or unrepeatable become scientific fact and since when does science work off of consensus? In 2007, Harris polled 500 geophysical and meteorological scientists and found that 52% attributed 20th century warming to human causes, 30% to natural causes, and the rest were unsure. But that was before Climategate, and seven additional years without warming, so the percentage is probably lower, now. What would be the point? First, science is not done by "consensus." Second, we know from the history of science that what is currently held to be "true" or "correct" isn't always so. "Consensus" is not a standard by which scientific veracity is established. According to 97% of divinity school graduates, the overwhelming majority of global warming alarmists are agnostic or atheist. In that an overwhelming majority of Earth’s population believe in a supreme being, wouldn’t that make them God deniers standing against consensus? 97% of Americans agree think all this global warming hoopla is the least of their concerns. 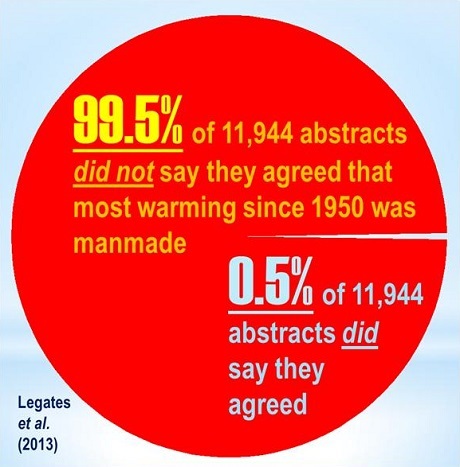 Consensus is a meaningless idea in real science. It only takes ONE person to discover and publish a correct theory, Others can then validate and/or reproduce the same results as further proof of the original idea. There is NO voting in science. The fact that "consensus" is used at all tells you this is propaganda from some kind of "groupthink". There was never any registration of applicable scientists nor any actual voting. The laws of science were never arrived at via a legislative process. Science is not a democracy. The idea of a scientific consensus is an oxymoron. If scientific theory and truths were determined by consensus then we would still all be believing in the Ptolemaic system that at one time was the scientific consensus So even if the 97% were somehow true it does not really mean anything. The reality is that there is no real evidence in the paleoclimate record that CO2 has ever had an effect on climate. There are conjectures that CO2 might have been a factor but no real evidence that it actually was. If a greenhouse gas ever had an effect on climate then H2O is the primary culprit. The climate change we are experiencing today is consistent with what has been going on during the Holocene for the past 10,000 years. The primary causes appear to be the sun and the oceans. It would appear that a major charge in ocean currents set off our current ice age cycling. The primary greenhouse gas in the Earth's atmosphere is H2O and it provides ample negative feedbacks to the addition of other greenhouse gases such as CO2 so as to mitigate any effect these other greenhouse gases might have on climate. Negative feedback systems are inherently stable and the Earth' s climate has been sufficiently stable to changes in greenhouse gases for life to evolve. We are here. Quite correct, if water vapor/cloud feedback was positive the Earth would have incinerated billions of years ago. Don't blame Zimmerman for that one, BTW. She was the student who did the grunt work of conducting the survey, but Prof. Doran is the one who formulated the bias-inducing questions, and who wrote the article claiming a 97.4% consensus, which he obtained by first discarding 97.5% of the survey respondents for being insufficiently specialized in climatology, and then also discarding at least half of the self-identified skeptics who remained in his tiny pool of just 79 self-identified climate specialists.